And finally: clothes. Although to be honest, there wasn’t really an overwhelming amount of interesting stuff. I did fall completely in love with one brand and see a few interesting things from others though, so that’s mostly what I took pictures of. Lovers of burgundy and/or hunter green, you’re going to have a good year. We’ll start with the cheaper stuff and work our way up, just because it’s more fun that way. First up, the standard and very low budget Horseware coat now comes in burgundy and hunter green. I know lots of you out there are going to be pretty excited about that. RJ Classics also added some hunter green and burgundy to their line. It’s been a while since I’ve seen or felt RJ breeches. I wasn’t much of a fan when they were the cottony fabric, but now it’s more of a tech fabric and feels a lot nicer. I’ve heard mixed things on the fit though, so we’ll have to wait and see what they’re really like. They had lots of cute shirts too. They’re definitely a little bit sheer in the white part and the fabric on the sides isn’t as luxurious as higher end brands of similar styles, but for a low budget option they have a sharp look to them. I actually like their cuff/collar fabric patterns a lot more than most of the TS or Essex ones. Colorblocking seems to be the new thing among sunshirt brands, but I have to say that I think EIS has done it best. Their new navy and white shirt is super sharp. Asmar has a new merlot color that is probably going to prove super dangerous to me. The sweaters look AMAZING in this color, and they even had a merino 1/4 zip. Samshield lovers, take note: they have jackets and vests coming out! They only had the jacket, but it’s a nice lightweight softshell with removeable hood, and the hood is decorated to look like the top of a Samshield. Kind of a cool item from them, and the basic gray color makes it easy to wear with anything. But my absolute favorite apparel that I saw? The entire Cavalleria Toscana A/W 2016 collection. I’ve seen this brand pop up here and there over the past few years (I’ve put a couple of their items in blog posts before, even) but this is the first time I’ve a) seen it in person b) seen such an awesome collection from them. There was a lot of burgundy and navy with some gray and taupe and hunter green thrown in. They are high end pieces, and they look it. The attention to detail is second to none. There wasn’t much in there that I didn’t like. This show shirt was one of my top 3 favorite items of the entire show. They’ve really mastered the art of being different while still being simple, elegant, and classy. Pretty excited that Luxe EQ will soon have CT in stock! She picked out some awesome pieces for the shop, from shirts to sweaters to jackets to breeches to show coats. I’m dying to try the breeches and see how they fit. CT might be my new favorite high end brand. Super impressed! Totally drooling over that EIS navy/white sunshirt. Very sharp with the color blocking. NEED. I don’t remember what the ship dates were on those. What was the price point on the RJ breeches and show shirts? Also, did you happen to see any burgundy/hunter green coming out of the TuffRider/Equine Couture brands? I think the show shirts were around $80 and the breeches were around $150. I didn’t stop in the TuffRider/EC booth since I really am not a fan of their stuff, but I don’t remember seeing anything like that from my quick walk through. 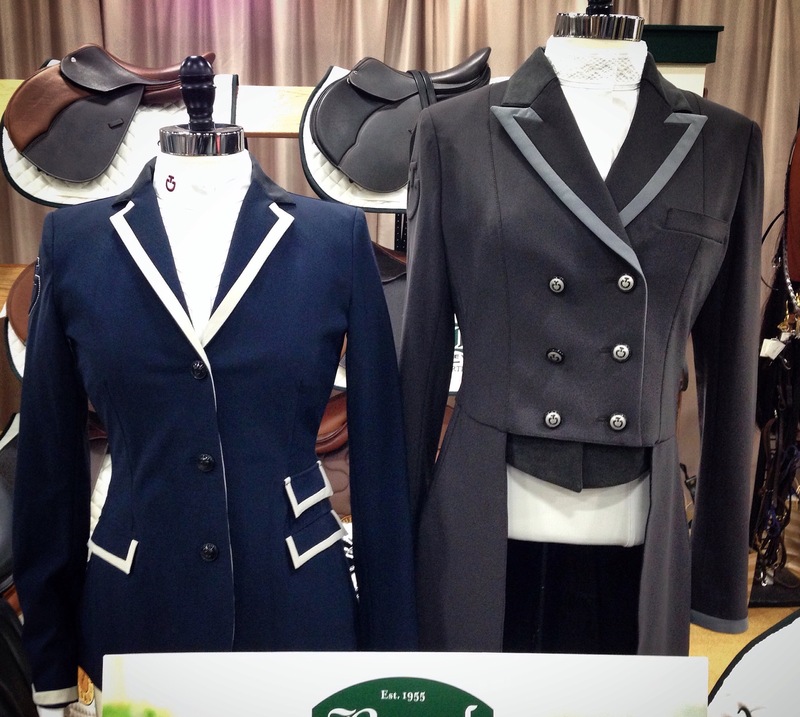 The EIS colorblocking does look fantastic … So, is the Horsewear jacket still single-vented in the back? I’m going to go sell a kidney now to buy all the CT stuff. Yeah the Horseware jacket is the same, just new colors. It’s worth selling a kidney, trust me. You should see CT’s burgundy jacket with black piping… omg. ooh i like those RJ show shirts a lot too, esp the paige. the patterns on the essex or TS shirts never particularly appealed to me, but i like how RJ did it. 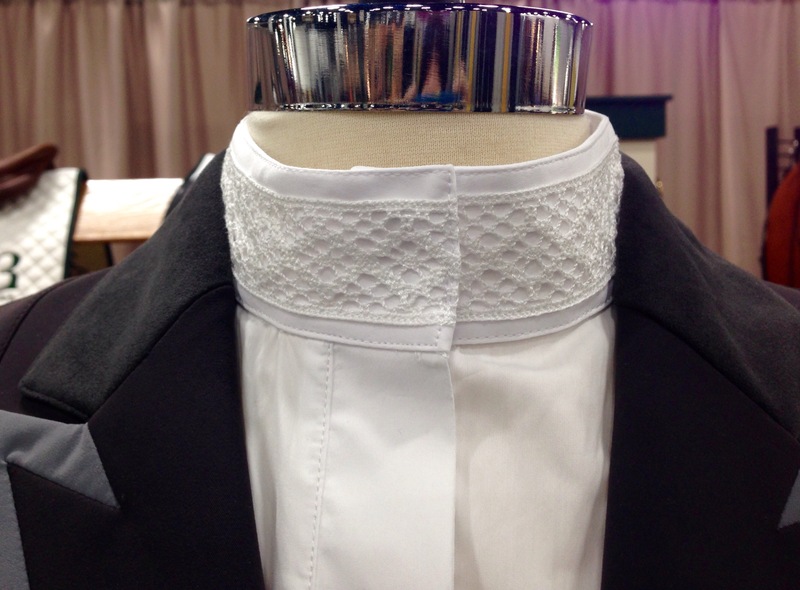 that detailing on the CT show shirt collar is really the perfect balance..
Burgundy and green must be the colors of the year. I really like that gray shirt with the pink and gray hounds tooth. Might have to look into that one. I’m loving the sunshirts! My pasty skin that doesn’t tan is so glad they’ve become such a thing! And man, those CT shirts and coats are gorgeous! The collar in the second to last pic is especially stunning, I think. Oh, it will be mine, trust me. I NEED that EIS shirt. Need it. Want all of the pretty things! Maybe I can sell an ovary or some thing? There has to be a market for that right? You can sell all kinds of things, I would think. Who needs two lungs? Or their entire liver? I can tell this will be a good season for my riding wardrobe, and a terrible one for my bank account. Glad to hear that wasn’t ombre. My ombre obsession is unreal and unhealthy. Oh and thanks for taking one for the team, schlepping up north outta the warm, to check out the new shizzle. I know a lot of people I follow on insta have that last show coat you mentioned. Super sharp! This fan of green says yay! 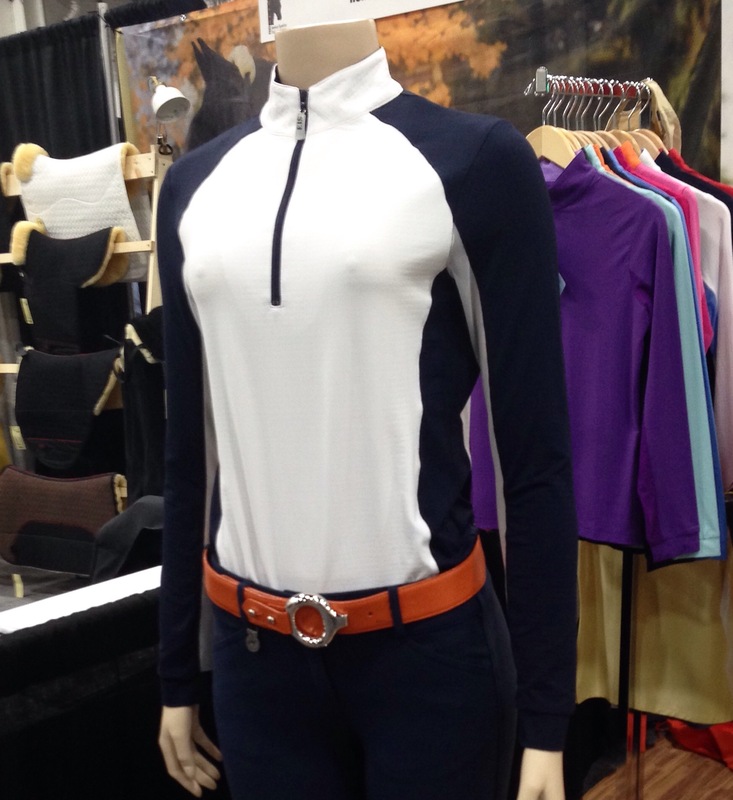 I have tried on the new RJ breeches, the Prestige Gulf in merlot. I had to size up and go long, but I’m a bit between sizes anyway. They were super comfy and I liked the mesh ankle and although they are “low rise” although they fit closer to mid-rise (I didn’t have to work about bending over without a belt on). I have not bought them, YET, but I think they might be my next purchase. The really old, higher-end RJ breeches were fantastic, some kind of techy scholler fabric; I still show in a pair of them. Then they got rid of those and just had the cottony ones, which were not great. I’ll be interested to see the newer, techy breeches now. oh the samshield jacked hood detail!! So cute! Then you have lots of awesome options! The prices are great for high end coats.